Albert Anthony Real Estate has partnered with REGENT PENN to bring modular homes to Pittsburgh. This broker-builder project is one of the first endeavors to build new homes faster and with less disturbance in the dense neighborhoods of Pittsburgh. The homes are constructed off-site in a climate-controlled facility in Pennsylvania, then shipped and assembled onsite. 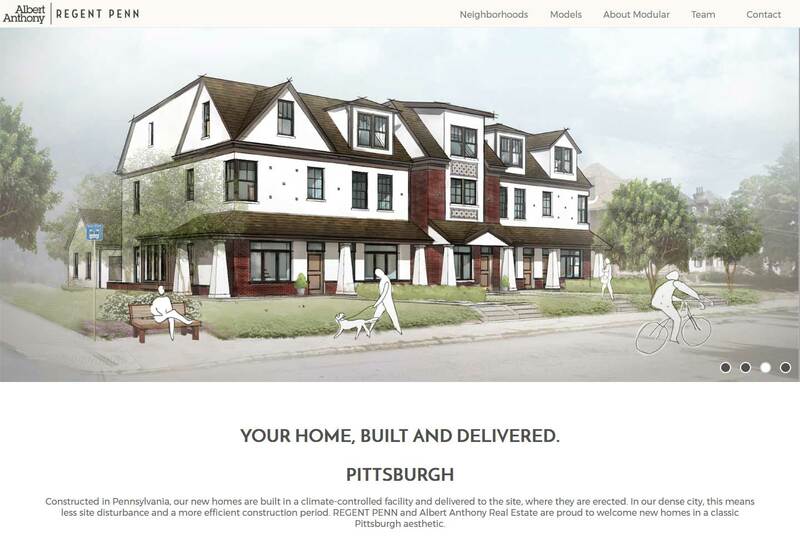 Because modular builds are so new to Pittsburgh, Albert Anthony and REGENT PENN needed a website to provide information about the benefits of modular. It also had to provide sales information so buyers knew what models were available and how to purchase one. We designed a website as clean and as straight-forward as modular building itself. The focal point of the homepage is a slideshow with renderings of the different models. Each model has its own details page with a filmstrip of photos, a paragraph about its features, a map point for location context, and a call-to-action to get in touch with the agent. The site also contains information about the neighborhoods where modular homes are being built. The website's clean, architectural design and intuitive user experience are designed to help users understand that modular construction is the way of the future... and possibly even their future home. Experience the full site at regentpenn.albertanthonyrealestate.com.